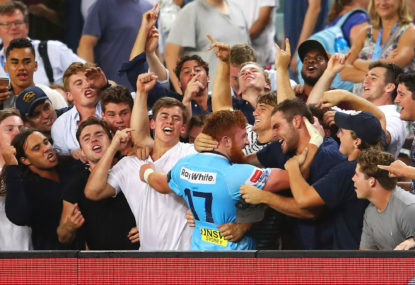 Rallying to captain Bernard Foley’s halftime exhortations, the opportunistic NSW Waratahs have launched remarkable second half comeback to beat the Highlanders 30-23 in their Super Rugby quarter-final. The Tahs, who finished Saturday night’s game at Allianz Stadium with 14 men, led 6-3 early on but conceded 20 unanswered points to trail 23-6 at the break. ‘We spoke about it at halftime: ‘let’s not have any regrets at the end of his game, let’s put it all out there and see how it falls’ and the guys really did that,” Foley said. NSW piled on three tries and 21 points after Highlanders winger Waisake Naholo was sent to the bin and scored all 24 points after the break. Their backline big guns fired, with five-eighth Foley scoring two tries and fullback Israel Folau one, and centre Kurtley Beale setting up two and Folau the other. A penalty to Foley, who scored a personal-best Super Rugby 25 points, expanded the home team’s lead to seven with 10 minutes to go. The Tahs then had to play the last six minutes with 14 men after prop Paddy Ryan was sin-binned when he was caught offside after Highlanders forward Shannon Frizell grounded the ball just short of the line. They hung on with some desperate defence to clinch a semi-final spot. “As much as we laud our attack, our defence won us the game,” Tahs’ coach Daryl Gibson said. “I thought we were poor in the first half, we lost four lineouts and we couldn’t get any possession, we couldnt hang on to anything, we couldn’t string any phases together, we were getting behind in the penalty count. “I said to the boys at halftime all we needed was to sort our ruck out. Naholo was binned after two high tackles in a few seconds on Tahs prop Sekope Kepu as he tried to stop a barnstorming run from the Wallabies front-rower. In the first half everything seemed to be going wrong for the Tahs after a promising start. Discipline was an issue in the half along with poor defensive reads and line speed, and the failure to sustain pressure when in possession. Naholo went over for the first try after centre Curtis Rona rushed out of the line. Centre Rob Thompson sliced through a hole for the visitors second try. Highlanders’ coach Aaron Mauger said his team played the first half exactly how he had wanted. “We wanted to hold the ball and put them under pressure,’ Mauger said. “Obviously the Waratahs are a class attacking side and we knew that and I thought we deprived them of those opportunities in the first half. Waratahs forwards Michael Wells and Rob Simmons will both be subjected to the protocol for head knocks over the next week.